The chances of making a profitable stock trade may be increased by the proper analysis of available information. However, it seems that penny stock investing is all too often left up to serendipity because there is little information with which to analyze. Many people depend on others to give them the latest hot penny stock picks, but they soon realize these penny picks are a good way to lose money. Penny stocks are found on many different exchanges and listing services. An understanding of the listing requirements of these markets will help you understand which companies are more likely to provide valuable and timely information and thus provide the opportunity to make well informed decisions. NASDAQ penny stocks can provide sufficient information and at the same time trade at a low price per share and low market valuation. The same is true for NYSE penny stocks. Jason Bond has an investment strategy for these low priced high quality stocks. This article will provide details regarding the reporting requirements for companies on the NASDAQ and NYSE, along with other minimum requirements for share price and market capitalization. This information may help you find stocks which by definition are a penny stock and at the same time have better financial and reporting metrics. Each NASDAQ tier has initial listing and ongoing listing requirements. Initial requirements are the requisite standard that need to be met for a company to list on the exchange. The initial listing can be an initial public offering, often referred to as an IPO, or in other cases the initial listing will come from a company moving from a less regarded listing service such as the OTC Markets or OTC BB. Companies listed on The NASDAQ Stock Market are subject to regulations regarding the disclosure of material news. “Material news” is information that would reasonably be expected to affect the value of a company’s securities or influence investors’ decisions. The table below summarizes the ongoing listing requirements for NASDAQ traded stocks for minimum bid price, requirement for disclosure of material news, and public market value. As can be seen in the table it is rather easy to maintain a listing on the NASDAQ and along with trading on the NASDAQ investors get the assurance of timely news and disclosure of material facts. There are additional requirements for companies to maintain trading on the NASDAQ including stockholder’s equity, market value of listed securities, net income, number of publicly held shares, and number of public holders of shares. Depending on which standard is applied a company will need to meet minimums for some of these additional requirements. The NYSE has three different standards with minimums for the following criteria, all the details can be seen on the NYSE website. The ongoing requirements for the NYSE are similar to the NASDAQ, but the values are higher as seen in the list below. Regardless of the numeric values for the criteria above if a stock’s average closing price is less than $1.00 for more than 30 consecutive trading days the company is risks removal from the exchange. NYSE penny stocks like Radio Shack are often large corporations which have fallen on hard times. The large financial firm Citi was a NYSE penny stock during the financial crisis that began in 2008. The company did a reverse stock split and sold off assets. These actions along with an improving economy allowed Citi to remain on the NYSE. 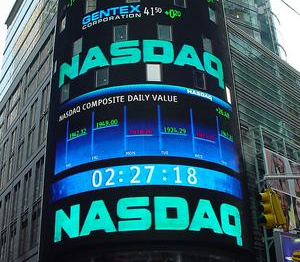 Are NASDAQ Penny Stocks a Worthwhile Investment? You may be wondering, “why do some companies trading under $1 or with a miniscule capitalization show up on the major exchanges?” Furthermore, are there NYSE and NASDAQ penny stocks worth your investment? The short answer is “yes” because companies can have a set of bad events which lowers the value below the exchanges minimum requirements. The company has a defined period of time to come back into compliance with the requirements. There is the potential for company turnarounds that can result in gigantic investor profits as detailed in this article where companies fell to penny stock status and then bounced back as the company’s operations improved. Companies can also trade under $5 which qualifies it as a penny stock under the SEC definition. Remember, the initial listing price minimum is $4 so fluctuations in company performance or stock market gyrations can result in good companies labeled as NYSE and NASDAQ penny stocks. The initial listing requirements are higher than ongoing listing requirements, put another way, it is more difficult to qualify to get on the NASDAQ or NYSE than it is to continue trading. For example, the initial price requirement for the NYSE and NASDAQ is $4 per share, but the continued listing requirement is $1.00. If the company does not come back into compliance with the exchange’s requirements the company will be removed from the exchange and most likely be listed with the OTC Bulleting Board or OTC Markets. Many times a company will do a reverse split which lowers the number of outstanding shares but increases the share price and then the company can continue trading on the exchange.